‘Albertine’s bar is nothing less than a local landmark: started in 1978, albeit in a rather different guise, by Sarah McEvedy (current co-owner and Allegra McEvedy’s mum), the cool, cosy pew-lined room provides a much needed restorative haven from the mayhem of Shepherd’s Bush. Use it how you will: pop in for a quick glass and plate of cheese or charcuterie or settle in with the expansive, contemporary yet classic wine list for a few hours. Take advantage of Head Chef Roberto Freddi’s bar menu that reaches from Syrian marinated olives courtesy of the great delis on the Uxbridge Road to a full three-course supper via an eye-catching array of scrumptious snackier sharing plates. ‘Our first floor restaurant is a relaxed, airy room providing the perfect contrast to the busy bar downstairs. Here Head Chef Rob gets to spread his culinary wings across the mostly pan-European menu in a room designed for conversation and bonhomie. Open, friendly, warm. We are greeted at the bustling downstairs bar by our polite and pally 20-something waiter and taken to the upstairs dining room, which is lovely: uncluttered and airy, with summer evening light streaming in through large sash windows overlooking the busy street below. White and pale green trellis-patterned wallpaper is striking but not overpowering; country pine tables and chairs dressed with white linen and gleaming glassware fit perfectly with the unstuffy yet polished vibe. There’s some modish mid-century stuff—wide cylindrical pendant lights—and fantastic dove grey painted bookshelves reaching to the ceiling, packed with all manner of eclectic reading matter: biographies of Churchill and Oscar Wilde, loads of cookbooks, a pleasing tome called ‘The Art of Drinking’ and a 1938 edition of Larousse Gastronomique in the original French, with a preface by Escoffier. You feel that a lot of thought and love has gone into the place; it’s rather like being in the comfortable home of a cultured and well-travelled friend. This impression is enhanced when the proprietor, celebrity chef Allegra McEvedy, bounds in to say hello, all smiles and humorous charm. At eight months pregnant she’s full of energy and neither starry nor precious, insisting that a glass or two of yummy red fizz (more of which later) are just the ticket at such a late stage of being up the duff. She introduces us to Rob, the talented chef, and Richard, the funny, sardonic sommelier, both of whom look after us very well for the rest of an extremely enjoyable evening. When it first opened in the late seventies, Albertine was an immediate hit with BBC staff as it’s just around the corner from the old Television Centre, and creatives in those days tended to like their booze. The people who came up with Eastenders had meetings there; Albert Square was named after it. TV Centre is sadly no more but Albertine, one hopes, retains a place in the bibulous hearts of many an erstwhile broadcast journalist or producer. Its new incarnation is likely to inspire equal loyalty: jolly groups of punters crowd the bar downstairs, while the dining room plays no less convivial host to a slightly older crowd, mainly couples the night we visit. We kick off with a generous plate of mixed charcuterie and very good bread and olives, an indication of the quality of the bar food served downstairs. Allegra recommends my starter: watermelon gazpacho garnished with generous crumbs of tangy, snowy feta and finely chopped chives. Gosh what a pretty bowlful, Schiaparelli pink with flecks of green and little dollops of white. It was no less easy on the tastebuds, cool and wonderfully refreshing on a balmy summer evening, sweet juicy fruit blending perfectly with the soup’s more traditional fresh tomato-ey, salady flavours, creamy feta adding another pleasing dimension. Andy’s tuna carpaccio was a delicately flavoured delight, paper thin, scattered with lemon zest and drizzled with good, peppery olive oil. Simple and delicious. To follow, I went for the mussels with jamon, sherry and tarragon, a punchy combination of flavours that elicited moans of pleasure and had me wiping the bowl with the buttery garlic baguette thoughtfully provided to accompany them. Andy’s Toulouse sausage with puy lentils looked hearty and rustic. Again simplicity won the day, with him declaring it ‘absolutely delicious and a complete meal in every mouthful’. For pudding we shared a strawberry cheesecake, basically summer on a plate, light, creamy, fruity, fragrant, the perfect end to a meal in June. Albertine may be first and foremost about the wine, but the food is very good indeed, and well worth a visit in its own right. Ah, now we’re talking. 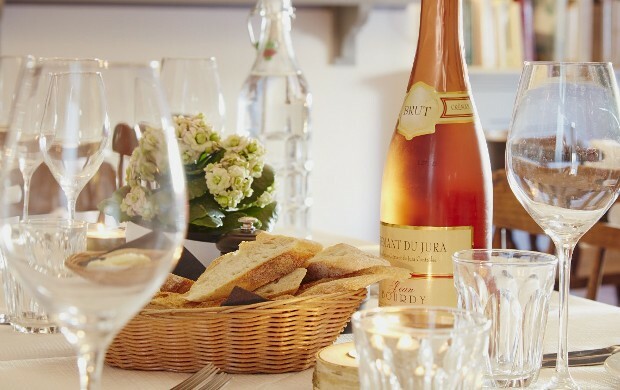 Albertine offers over twenty wines by the glass from a seasonally changing and extensive list. Not here the obscene mark ups at some establishments: the most expensive white on the current list is an Australian Heytesbury, Vasse Felix 2014 at £68, the priciest red another Australian, organic ‘Efferus’, Rugabellus 2013 from the Barossa Valley, at £70. You can also buy bottles and cases to take away. Richard suggests we start with a vintage sparkling Shiraz, Coonawarra 2009, something I would never have considered. It’s a brilliant recommendation, light and invigorating, yet full bodied enough to stand up to some of the more robust flavours on the menu. He tops up our glasses assiduously, so much so that we must have motored through a few bottles by the time we get to pudding. I don’t switch to white to accompany my mussels, which is practically unheard of for me, though Andy asks Richard to recommend something red with which to wash down his sausages. A large glass of Chateau Pierre Bix, Les Rouannieres, Coteaux du Layon 2010 seems to do the trick. We finish with a dry Muscat, Domaine Vaguer, Escapade 2015, which perfectly complements the delicate flavours of the cheesecake, better by far than a sweeter, more syrupy choice might. Eventually we totter out into the warm June evening feeling extremely pleased with life. It’s that sort of place.